Keep your music department garments neat and tidy. 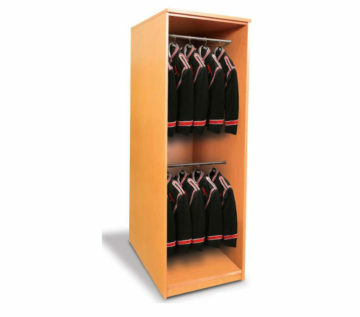 Efficient, lockable choir robe and band uniform storage. Our steel garment shelving units come in a variety of heights and widths to accommodate either one or two levels of hanging garments. Whether it be for choir robes, marching band uniforms, or even drama costumes, we have you covered. All units are 24′′ in depth—perfect for hanging garments and available with one or two rails. Powder paint coated steel is not prone to absorb and retain moisture, as can be a problem with wooden cabinets. Add-A-Shelf to your garment storage unit if you wish for those unique storage needs. Also available for these units are Rollok Tambour Doors to protect your uniform or robe investment. 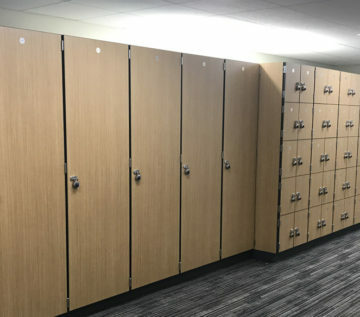 These doors disappear above the shelving with all garments visible and easily accessible. The portable carts you developed for our marching band carts are extremely durable, easy to move and space efficient. You design of the shelving units for our drum line equipment, jazz band equipment and other miscellany has helped us retain more classroom space. I give you and your company my highest endorsement. Now you can store your marching band uniforms anywhere you like, then roll them up into a trailer or truck and take them out to performance sites. Add a nylon cart cover to protect it and the uniforms from dust and the elements. Shipped fully assembled, and ready for use. Shown with optional nylon cart cover with velcro closure to help protect items from dust and the elements. Our garment shelving units come in both steel or high-pressure laminate. We carry a variety of heights and widths that can accommodate one or two levels of hanging garments. Cabinets are available with open shelving, or HPL doors for a cleaner look and added security. See what Music Filing can do for you. Download our brochure with detailed options and specs. Ready to improve your music storage? 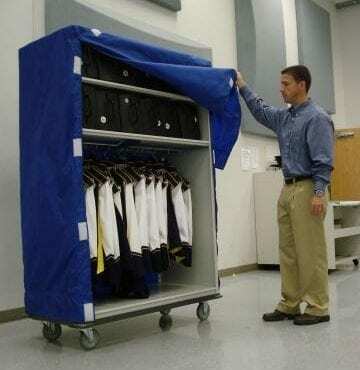 We can improve your music departments garment storage so you students feels just as important as the football team.